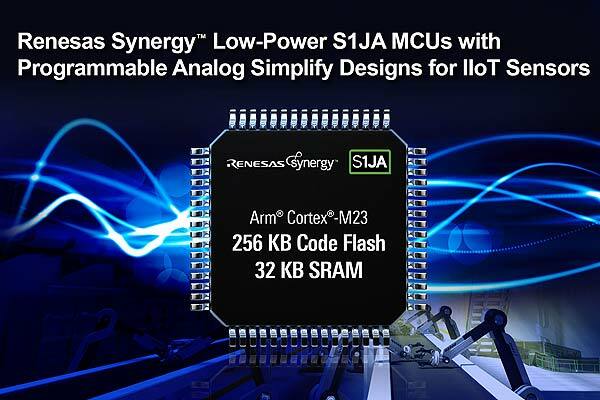 Renesas Electronics Corporation expanded its Renesas Synergy™ S1 microcontroller (MCU) series with the introduction of the S1JA MCU Group. The ultra-low power S1JA MCUs feature the 48 MHz Arm® Cortex®-M23 core and integrate best-in-class programmable analog and security functions for high-accuracy sensor signal acquisition and conditioning. The S1JA MCUs target cost sensitive and low power Industrial Internet of Things (IIoT) sensor applications such as flow control meters, multisensor systems, headless medical monitors and instrumentation systems, and single-phase electricity meters. The S1JA Group include five MCUs with up to 256 KB flash memory, up to 32 KB SRAM memory, and a wide operating voltage range of 1.6V to 5.5V. Each MCU integrates a sensor-biasing unit that supplies accurate power to the external sensor, and a highly configurable analog fabric that processes complex algorithms to maximize signal conditioning and precise analog measurements. On-chip analog components include a high accuracy 16-bit analog-to-digital converter (ADC), 24-bit sigma-delta ADC, fast response 12-bit digital-to-analog converter (DAC), rail-to-rail low-offset operational amplifiers, and high-speed/low-power comparators. The S1JA MCUs enable advanced analog configurations from basic functions to more complex analog blocks. As a result, embedded designers are able to reduce BOM cost and PCB size by eliminating several external analog components. Access to capacitive touch enable pins allows designers to develop touch button HMI interfaces, and the S1JA’s memory mirror function enables over the air updates with little software overhead. Ultra-low power allows the S1JA MCUs to extend battery life for battery-operated portable and battery backup applications. Their best-in-class software standby mode consumes a mere 500nA to enable 20-year battery-operated applications that spend extended periods in sleep mode. In addition, the S1JA’s integrated AES cryptography accelerator, True Random Number Generator (TRNG) and memory protection units provide the fundamental blocks to develop a secure system that connects to the cloud. The Renesas Synergy Software Package (SSP) supports the S1JA MCUs with HAL drivers, application frameworks and RTOS. The SSP also includes six new modules that simplify interconnecting the configurable internal analog blocks. Embedded system designers can use either of the Renesas Synergy development environments–e² studio or IAR Embedded Workbench®–to build and customize their designs.